What Does My Childhood Have to Do with My Retirement? When I was young, I had a dream of being a singer/songwriter and Carole King was my idol. I would spend lots of time at the piano; I taught myself how to play guitar and listened to all the music I could get my hands on. I wrote some songs and then came college, marriage, a child and full engagement in my career as an executive. All that pushed music into the background. The dream and the longing never went away and yet I lost my connection to it. When I retired from my executive life last year, that new freedom opened the door for me to reengage the dream. Within months of retiring, I picked up my guitar again. I found a singing teacher and a neighborhood band to play and sing with, and when a friend of mine asked me if I’d like to join her on her trip to Nashville, I immediately said, “Yes!” It was one of the most inspiring trips I’ve ever taken. 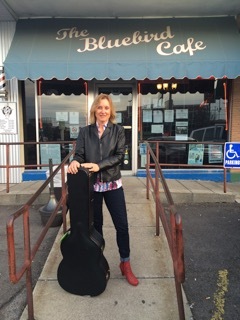 I ended up playing open mic at the Bluebird Cafe, one of the world’s most iconic yet unassuming listening rooms where chart-topping artists (and regular folks) come to perform their music unplugged, unannounced. Playing at Bluebird was a dream in itself for me! I came home and wrote a new song, and now have a songwriting mentor. At this stage of life, whether I end up on a world stage like Carole King or not doesn’t matter. It’s about re-engaging the dream, learning new skills as a musician and songwriter, and enjoying the process. I have regained what I thought I had lost back in my childhood, I’m having a lot of fun, and my life truly is reinspired. When we come to the end of our careers as we’ve known them and move into the next chapter, reclaiming things we loved to do as a child can really enrich this next chapter of life. The wisdom and resources we gained during our hard-working career years can give us the freedom to reclaim and reengage our childhood dreams and make these later years the most creative and fulfilling of our lives. So if you have retired or are thinking of retiring from your full-time career and aren’t sure what you’ll do, look back into your childhood for those things you loved to do and for those dreams you never followed. They are still in your heart and will show you the way to making your next chapter the most creative and fulfilling of your life. Join us at Life Reinspired, a life reset lab for successful Baby Boomers contemplating a meaningful next chapter. Find out more about our retreats. The best is yet to come! LifeReinspired.com. Sabrina has just posted a wonderful blog entry–personal and inspirational. Check it out!